SYDNEY, Australia – February 19, 2016 – Delong Tech Company has revolutionized the technology industry with Aijia Pro – their second generation smart robot. The first generation robot received over $2 million in crowdfunding support in 2015. Now loyal fans are excited to become backers in the release of the Aijia Pro robot. The company’s latest Kickstarter campaign has reached over 160% of their funding goal of $7,098. 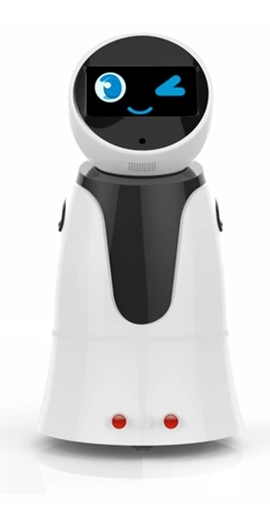 Aijia Pro is the first telemonitoring/video robot with a colorful facial expression and many smart functioning capabilities that offer a personal touch that every household deserves. The robot can have voice conversations with anyone in Chinese or English, offer a 360 degrees‘ head rotating monitor, has an alert mode for home security, one-click photo and video capability, and much more. The device has Bluetooth capability so users can remotely control the robot with their phone. Aijia Pro also has a convenient wireless automatic charging version, which is very useful when no one is at home and the robot needs to charge to protect the house. It is a light and compact robot that is 9.46 inches wide, 26.56 inches tall, and 13.75 inches in diameter. To make a contribution to this campaign, visit the Kickstarter campaign or click here. Perks will be delivered by September 2016. Rewards range from t-shirts to early-bird discount specials for the robot. Share this incredible campaign on Facebook, Twitter, and other social networks. The more people know about this, the more support the campaign will receive! Delong Tech company team consists of more than 30 doctors, masters, engineers, research and development team. The AIJIA project aims to partner with every family and protect family members all over the world. The second generation robot focuses on improving home security monitoring that is safe and approved by CE and FCC. In the future, the company plans to improve home healthcare for families with the third generation Aijia robot. Dieser Eintrag wurde veröffentlicht in Crowdfunding, English, General und verschlagwortet mit Kickstarter von Sebastian Trella. Permanenter Link zum Eintrag.